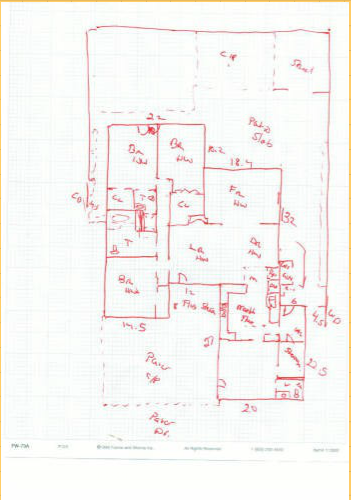 We can transform any sketch into an EZfloorplan! Scroll down this page to see sample sketches. There is more than one way to quickly and easily create your sketch. Pick a method that works best for you, remember we want you to be completely satisfied, so you will be able to review your EZfloorplan and send it back for corrections as many times as you like. 5. Do not forget to include other items such as a garage and decks or patios, etc. 1. Start on a outside corner of the property* and count the number of steps to the next corner, draw the wall on the graph paper using 1 step = 2 squares. Sketch in any windows and doors you see. Turn in the direction of the next wall and repeat the process until you go all the way around. * Even if you can not start on a outside corner, you can use this method on the inside of the property, combining steps 1 & 2, working from room to room. Already have an old floor plan?